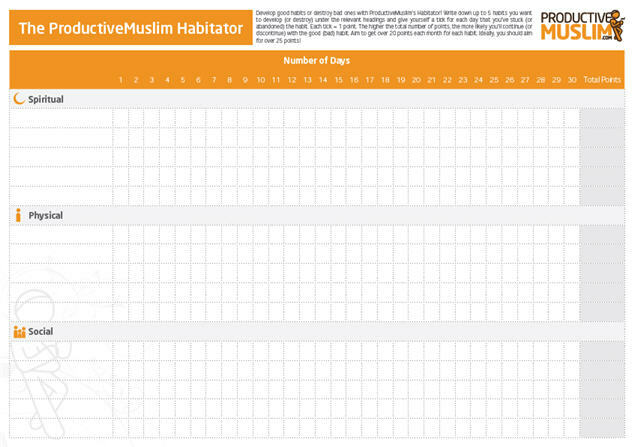 How to use The ProductiveMuslim Habitator ? Spiritual Habits, e.g. Praying Tahajjud each night, fasting every Monday/Thursday, avoid being late for Salah, Praying in the Masjid. Physical Habits, e.g. Eating breakfast each morning, Jogging 20 minutes each morning, going to the gym. Social Habits, e.g. Visiting an Orphan/Widow offering help, Doing Dawah to 1 person at least per day, giving Charity, avoid getting angry/irritable. Once you’ve described your habits, give yourself a tick for each day that you’ve stuck (orabandoned) the good (or bad) habit. Each tick = 1 point. The higher the total number of points, the more likely you’ll continue (or discontinue) with the good (bad) habit. Aim to get over 20 points each month for each habit. Ideally, you should aim for over 25 points.